Planning permission has now been granted to redevelop the old Gloscat campus. This is an important archaeological site which lies within the walls of the Roman and medieval city. Most of the archaeology will be preserved under the new development, but some archaeological excavation will take place. 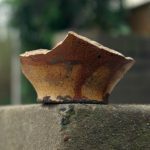 A community archaeology project is now underway. The work is being done by local people with an interest in the past under professional supervision from Cotswold Archaeology. Land was donated to establish a Franciscan (or Greyfriars) friary in Gloucester in 1231. The remains of the main church lie behind you. You are standing in the area which would have been occupied by lodgings for the friars and the cloisters (a covered walkway around a central garden). 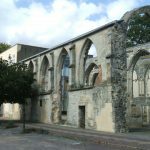 The cloisters were demolished following the Dissolution of the monasteries by Henry VIII in 1538. The church survives because it was turned into a brewery! We know very little about the cloisters, so any new information will be extremely valuable. 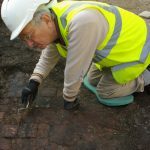 Part of a floor made from glazed medieval tiles was found in 2006 and we are hoping to uncover more of this in the coming weeks.